Violence has again engulfed Kenya, after television video showing police shooting a young, unarmed anti-government protester to death enraged opponents of President Mwai Kibaki. According to opposition leaders, at least seven more people had been shot and killed in the Mathare slum early on Thursday, and a 5-year-old boy in the Kibera slum was wounded in the leg, CBS News reporter Katherine Arms reports. Both sprawling slums are in Nairobi. Anger is high across the country after the scenes of vicious violence from the town of Kisumu aired on local the private Kenya Television Network. The video shows a lone policeman chasing a handful of unarmed young men down a side-street in the town of Kisumu. The policeman is seen firing and two of the men fall. The policemen then kicks one of them. In a statement sent to Arms by opposition leader Raila Odinga's Orange Democratic Movement, the party said it "condemns in the strongest terms the cold-blooded execution of a wounded youth who was peacefully protesting in Kisumu." "We demand the immediate prosecution of the officer who committed this murder, and those who have issued the shoot to kill instructions to police. This killing and the other acts of violence inflicted on peaceful protestors will be part of the case we are filing with the International Criminal Court in The Hague," against the Kibaki government, the ODM statement said. Kibaki was declared winner of a contested Dec. 27 election - deemed deeply flawed by international observers, which touched off weeks of violent protests and clashes along tribal lines. On Thursday, police fired tear gas and live rounds to break up opposition rallies in several cities, killing at least two protesters. Odinga said seven people were shot and killed. Police Spokesman Eric Kiraithe said police killed two "criminal" protesters, one in western Kenya and one in Nairobi. "Everyone is scampering away from the police," said Collins Odhiambo a protester in the western town of Kisumu who carried a white handkerchief as a sign of peace. "They killed too many of us yesterday and now people are staying away because they don't want to be shot." Machete-wielding young slum dwellers in Nairobi hurled stones at police who fired tear gas and gunshots Thursday, the second day of opposition protests. Arms says Thursday will likely be far more violent than the previous day, due primarily to the airing of the video from Kisumu. Most of the violence has pitted members of the president's Kikuyu tribe against other ethnic groups, including the Luo, of which Odinga is a member. "Our rallies will continue until the government sits down with us and seeks a solution," said opposition spokesman Salim Lone. "Calling off rallies would be admitting defeat to those who first stole the presidential election and are now killing innocent protesters on sight." Speaking to reporters, government spokesman Alfred Mutua repeated President Kibaki's position the opposition should take its grievances to court and said Kibaki's administration "is very open to dialogue." Riots and ethnic killings in the wake of the disputed vote have marred Kenya's image as a stable democratic oasis in a war-ravaged region and damaged its tourist-dependent economy. It has also exacerbated long-simmering ethnic tensions and conflicts over land. 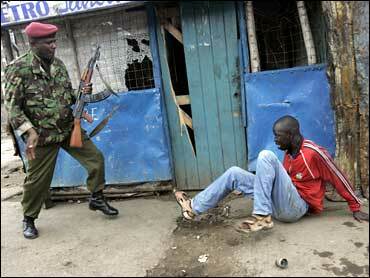 In Nairobi's Mathare slum, residents hid indoors and crouched on the floors of shops as young men ran past. Police fired tear gas down dirt alleyways and gunshots into the air. One Red Cross medic said his ambulance picked up a 24-year-old with deep machete cuts to his head and neck and a fractured arm. The medic asked not to be named because he was not authorized to speak to the press. As he spoke, another man staggered down the road, bleeding profusely from the head and mouth. "Help me," he begged before collapsing. Jack Owich, his 22-year-old companion, said the two had been attacked by a gang from a rival ethnic group two blocks away. "They were Kikuyus," the opposition supporter said, naming the president's tribe. Police also fired tear gas in downtown Nairobi at dozens of protesters, some of whom threw stones. In the western town of Eldoret, gunfire echoed across town as police fired warning shots to break up several dozens-strong groups who tried to gather. Some protesters overturned kiosks and pushed them into roads to block them, and tires burned in the city center. Arms reports some human rights groups have become "very upset" by security forces' use of live rounds. The government has banned the rallies, but the opposition and Kenyan human rights groups say the government has no authority to do so. This week, 13 nations, including the United States and Britain, increased pressure on rival politicians to find a solution, threatening to cut aid to the government "if the commitment of the government of Kenya to good governance, democracy, the rule of law and human rights weakens." Mutua told reporters: "The government of Kenya will not be blackmailed ... We are able to support ourselves." About 6 percent of Kenya's budget comes from foreign aid. The unrest, though, has hurt the economy, particularly the key tourism sector. In Britain, the Federation of Tour Operators extended a ban on charter flights to Monday. The Press Association quoted the largest British tour operator to Kenya, Somak, as saying they were offering alternative vacations in India. A few dozen miles outside the western town of Eldoret, 12 empty trucks and buses blocked a main road. The drivers, milling nearby, said they had been stopped overnight by around 150 young men armed with machetes who robbed them, flattened their tires and stole fuel. One bus was filled with aid supplies from the U.N. World Food Program. Late Wednesday, the United Nations launched an appeal for nearly $42 million to help half a million Kenyans affected by the violence. U.N. humanitarian chief John Holmes said the money was needed to provide food, shelter, health care and other services for the next six months. U.S. Ambassador Michael Ranneberger, speaking by telephone hookup Wednesday from Kenya to a conference at the Center for Strategic International Studies, a Washington think tank, said a power-sharing arrangement was "the only thing to do," but it would not be easy to persuade Kibaki and Odinga to agree to such a compromise. But "both have looked us in the eye and said they are willing to have a dialogue," Ranneberger said, adding Kibaki's one condition is that he will not step down. The ambassador said a new election would be too expensive.